One more day and Holy Week is over and we’re back to our normal lives again. I’m back to school for sure, but just for 1 week cause its only finals week and then course card day. End of 2nd year college after that and hello ho ho ho SUMMER BREAK. How’s your week so far? Have you done anything holy? (err, hahaha) I haven’t and I don’t think I will as far as I’m concerned. 😐 You see, this year’s HW for me was just like another week for me (minus having classes). I had classes last Wednesday but just half day, looking back I’d say its a relief having classes on that day. If not for having school last Wednesday, I’d be bored to death here at home already. I won’t have any reasons to go out and enjoy a time at the mall, I could have started on my other subjects BUT I would be worried about not finishing my portfolio project for the other project. So good thing I had classes last Wednesday, I had a nice time having lunch with a friend 😉 and I got my portfolio ring binded by the end of the day. One task off the list and I can use the rest of my remaining free days to finish my two other projects for school. The way we spent holy week last year felt more genuine unlike this year that neither my mom nor my brother Alex went out of the city and to the province. It was only my dad who left for 3 days and came back — yeah sure, that’s holy week for you dad. Last year we stayed at San Fernando, La Union for Holy Week ’08 (at my brother’s uncle and aunt’s house) and it felt more like Holy Week there because the usuals were there such as no meat for x days (IDK should you not eat meat for a whole week? Having no meat for a week felt like years to me), hearing sad music on the radio (from what I remember, I thought those music playing on the province radio station were from the 20s era — yeah I feel like laughing at myself right now but I swear it does sound like some old age music way older than the 60s-80s) and PASYON (I know there is one but I haven’t seen it IRL) and the La Union boat parade (quite unique I must say). This year feels a bit different that I spent Holy Week here in Manila, in my home.. treating it just like any other day. I’ve become used to idea of seeing a sea view right this moment, but no.. I’m looking at a screen monitor. Oh well, it will never be the same again. Next year, after holy week probably, will be the start of my OJT. 😞 Bye real summer break. To my last summer break: I hope you become memorable to me. In other news, have you heard of the TV series “Chuck”? Sure you do! I blogged about it 2 posts back, its hard to miss. 😂 Anyway, I’m one of the people who are trying to keep this show from being canceled and removed from NBC. If you’re a fan and a religious follower of the show you’d know about this, and I’m sure we have the same sentiments about it. We don’t want this show to be canceled because its simply awesome (lack of better word to express my feelings right now.. Ryan McPartlin’s voice is going around my head ), storyline is good and not common (it looks like another spy themed series but this is action, romance, comedy, family all rolled to one), they have fresh faces on the cast lineup, etc. There’s just too many reasons why this deserves a third season. If you would like to also do your part in helping the show, there are many ways to do it.That’s where the Chuck Campaign: Watch/Buy/Share/Write More comes in, click the image for more info. 😊 It won’t even cost you that much to help save the show (unless you plan to buy the DVDs). I plan to do some real participating myself, writing a letter to NBC. 😛 We’ll see how this goes. So far I’m plugging Chuck endlessly on my Tumblr (even though I’m sure some people might be getting annoyed already hehe), Twitter and Plurk. I recently just got interested to this show, big thanks for my friend who already has back episodes so it was no problem catching up with season 1. And even though I’m just a new fan, I don’t want to end my fangirling to this show anytime soon. This is not a sponsored post. I’m doing this for my love of this show. Even I am surprised that I’m this dedicated with Chuck, really. 😛 Love makes you do crazy things, that’s what they say. My holy week was boring din. Hihi. Super plain nga lang eh, what I did lang is joined the procession plus attend the palaspas na misa hihi. Easter Sunday = normal day lang din. Haha di nga ako nakapag mass since hindi ako nagising sa tamang oras. Wow. Another great layout from Anna Banana. :] Hey. Links ex? How are you na? Nung holy week, nag bisita iglesia kami. 14 churches. Pero d kami nakapag stations of the cross! haha. Wow, La Union! 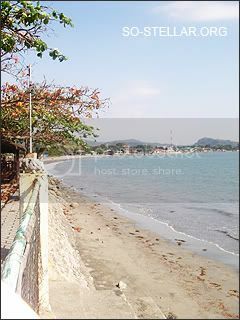 Tagal ko na ndi pumupunta diyan pero we used to go there every summer when I was younger. I love the beaches there and I used to love collecting hermit crabs too! Too bad i’m not fond of Chuck though. I tried watching an episode pero ndi ako makarelate, it wasn’t the first episode kasi hahaha. Holy Week was really nice for me this year. I got to spend time with my family which is good. Ako naman I’m used to staying at home during Holy Week. Our family always stays at home. We don’t follow any religious rituals whatsoever. We do eat fish only on Good Friday 😊 Hindi naman din kasi ganon ka-religious yung family namin. We go to Church every other week lang. Probably because my Dad is not a Catholic so as a sign of respect na rin siguro kaya we don’t do or practice some of the Catholic ways during Holy Week. NOO! Please NBC don’t cancel the show! I love Chuck as well, have you watched the latest episode? Chuck vs. The Dream Job? They can’t cancel it, just when the story is beginning to be much more interesting. No offense to Heroes fans but I think Heroes should be the one canceled not Chuck *lol* PEACE! LOL. My friend’s from CSB too and she’s alsooo taking up MMA (don’t know if you know her :P) but yeah, she said she’s also drowned in couuntless projects and stuff. But it’s okay, one year na lang, graduate ka na! BILIS!